Compression molding is a cost effective and exceptionally efficient technique. In simple terms, the rubber material is placed in an open mold’s cavities, which have been pre-heated to a temperature high enough to achieve vulcanization. Then the mold is closed, typically under hydraulic pressure, until the rubber is completely forced into the mold cavities. If there is overflow, it is captured in special channels called “flash grooves.” When the vulcanization is complete, the mold is opened, the parts removed and the operation is repeated. The reason for compression molding’s cost advantage comes from the fact that it’s relatively inexpensive to produce molds, plus high throughputs are achieved by the combination of low changeover times and high cavity density. One major problem with compression molding is flash, which if not property monitored can be difficult to control. 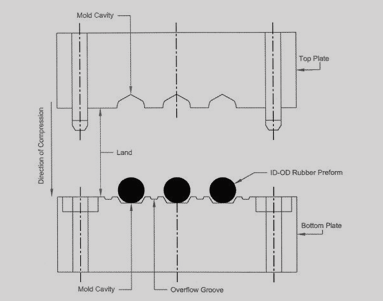 What’s more, compression molding usually requires longer in-press cure times, while finished parts exhibit the lowest tolerance control of the various other molding techniques.